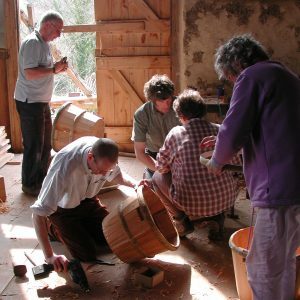 The Heritage Crafts Association is pleased to announce a new six-month research project that will provide a major update and expansion of its groundbreaking Red List of Endangered Crafts, first published in 2017. The first Red List of Endangered Crafts, authored by Greta Bertram, was the first to rank traditional crafts by the likelihood they would survive the next generation. It brought the plight of these skills to national attention, with coverage on the BBC One Show, BBC Radio 4 Woman’s Hour, and across national news and online media. It identified 45 endangered and 17 critically endangered crafts, which, for reasons such as an ageing workforce and a lack of effective training routes, faced an uncertain future. On secondment from his doctoral research on craft heritage at the University of Exeter, former HCA Trustee Daniel Carpenter will take up the role of Research Manager for the project, supported by the South, West and Wales Doctoral Training Partnership. The work will dovetail with that of the HCA’s recently-appointed Endangered Crafts Officer Mary Lewis, whose post, funded by The Dulverton Trust, has been created to identify and develop interventions to improve the prospects of such crafts. The 2017 version of the Red List is available to view at www.heritagecrafts.org.uk/redlist. If you would like to contribute information for the new version, please email Daniel Carpenter at redlist[AT]heritagecrafts.org.uk. The updated Red List will be published at the HCA Conference on 9 March 2019.